Irish folklore and everything that it has to offer has long been a common thread running through the centre of online slots gaming. Some of you may have grown tired of them, but they keep getting made because the audiences just keep coming back. 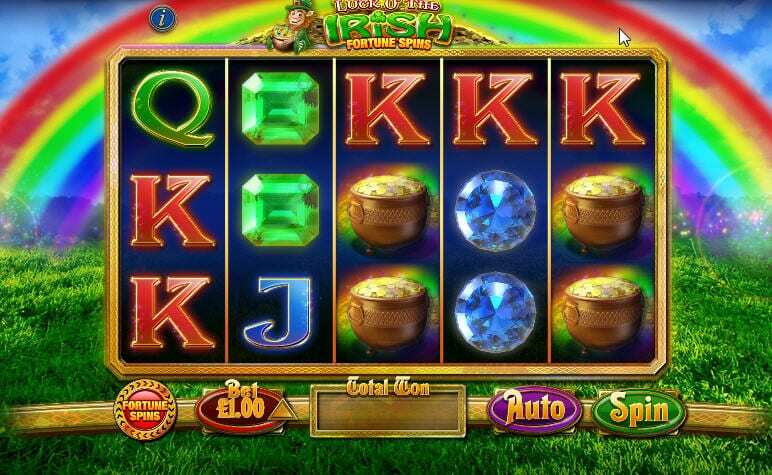 Use the luck of the Irish to navigate through 3 reels of traditional fruit machine fun with the help of a trust leprechaun. This game is designed to look like the old one armed bandits and is a perfect trip for any of you gamers out there looking for a bit nostalgia or few quid in your back pocket. A lucky Irish slot combined with the traditional formatted fruit machine, not bad eh? We all know everyone loves these slot online games just because of their sheer relevance to the point of playing these games, the lucky spins. Some have more luck than others when it comes to gambling but it’s just something about these Irish Casino slots that give punters that extra belief when they click the button. The vibrant green, the lucky little leprechaun or perhaps it’s the trademark Irish Guinness that we all pretend to love on St. Patricks day but really, it’s just so you can try and pretend you’re Irish for the day and celebrate with everyone, a free pass to go out drink and have a good time. So, whichever the reason this game will always be here, so you can have your own little St. Patricks day. The best part of it is its not one of those days where you go out and spend ridiculous amounts of money on pints of Guinness that you’ll never see again (well maybe in the morning) but a virtual whereby the money you spend provides you with not only Irish themed entertainment but the chance to win incredible prizes that will have you loving anything Irish related even more. the most played games within the industry itself. You can find out more about the other games available here. WGS Technology don’t mess around when it comes to producing games such as Lucky Irish. WGS Technology are at the forefront of online gaming entertainment and have been many years, producing exceptional standard of games like lucky Irish is just something they do on a regular basis without the stress and brainstorm of ideas most would go through. WGS Technology have a team of professionals who live and breathe creating only the best content that they know for sure will satisfy their customers. All the content they have produced has impacted the online gaming market significantly, putting their stamp on it ferociously. fortune written all over it, and with no rainbows in sight we think it’s safe to say that fortune favours the bold rather than the lucky! disappoint as they appear in the background of the game, if anything they cheer you on as you play. 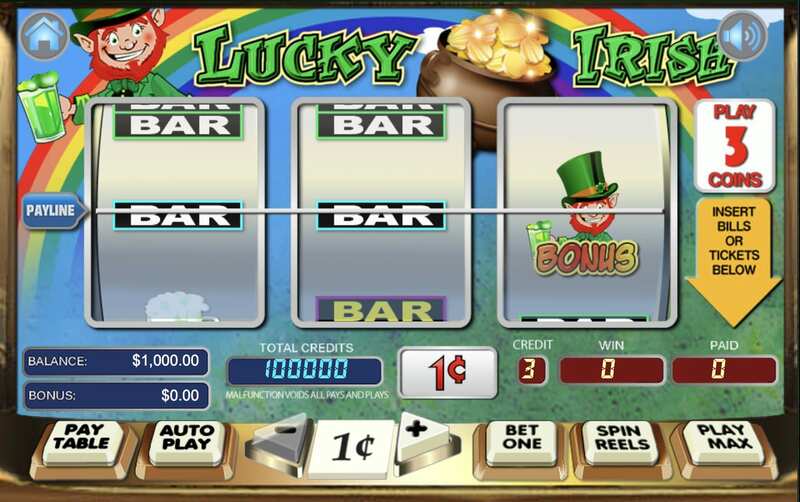 The pay-table of Lucky Irish is a mix of classic and thematic symbols. It is split into 3 columns, which reflect the rewards you are entitled to depending on the size of your initial bet. Winning combinations can include four-leaf clovers, bar signs in single, double and triple size, pints of ale and pots of gold. The majority of winning combinations consists of 3 identical symbols, try to match the pot of gold in order to gain more points. Bar signs can also be used in certain combinations to give a small but definite pay-out. Useful if you are someone who plays a lot and is looking for any pay-outs possible. match the pot of gold for example, you can multiply your wager by 2,400 whatever you bet to begin with! Look out for the leprechaun symbol which will give you the chance at a bonus mini-game where you can click leprechauns to reveal cash prizes! A real Irish thriller of a game that once it’s played will stick to you like Guinness sticks to an Irishman himself, for life. All the bonus features that have already been mentioned are just a snippet of why you should play this game, an Irish theme like this holds all the importance of Ireland itself. Including all the fantastic wonders that it possesses. From Leprechauns to the pot of gold that so many of us crave, so make the pot of gold a reality and throw yourself into a glowing green atmosphere that will light up your life and the potential click of a spin.